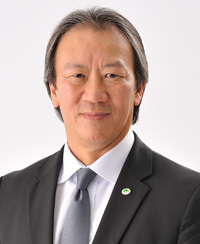 Message from Chairman of Hitachi Asia Ltd.
Today, society and customers desire innovative solutions to issues. In order to respond to this desire, Hitachi Group has been striving to be innovative by delivering innovations to customers and society through the fusion of operational technology (OT), information technology (IT) and our wide range of products and services. With more than 100 years of expertise and group-wide capability, the ongoing focus on our Social Innovation Business initiatives enable us to develop a safer and more sustainable world by integrating IT and infrastructure technologies. Asia is a very dynamic and diverse region which offers tremendous opportunities for Hitachi. Everyone, including myself, is expected to drive the growth of business as we are working in one of the most promising emerging economies in the world. The strategic path we have taken in this region has allowed Hitachi to be more proactive and competitive. As a trusted solutions provider, our company is well-equipped to meet and even exceed the expectations of the growing list of business partners and customers. Under the 2018 Mid-term Management Plan, Hitachi sets out to accelerate collaborative creation with customers through the advanced Social Innovation Business, in order to become an Innovation Partner for the IoT Era. In the plan, we will focus our efforts in four business domains – power and energy; industry, distribution, and water; urban; and finance, public, and healthcare. Our IoT platform “Lumada” will provide new and unprecedented innovations to our customers in times of digitalization. Our strong commitment to all stakeholders is captured in our Company Vision - "Hitachi delivers innovations that answer society's challenges. With our talented team and proven experience in global markets, we can inspire the world." With a very solid brand driven by our dedicated team of people, and empowered by our innovation and advanced technologies, we are well-positioned to bringing social innovation to Asia.